Preston Guild Hall could be taken over by a private company under plans put forward by the city council in a bid to save money. Adverts have been placed in publications including The Stage inviting applications to buy, run or sponsor the complex. 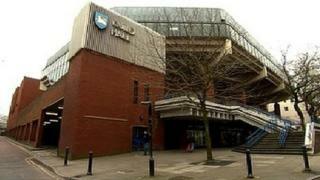 The council revealed earlier in the year that it was looking to reduce the venue's £1m a year running costs. Any potential buyer must keep a theatre running, the council said. It has set September as the deadline for any bid. Councillor Tom Burns, cabinet member for arts and culture in the city, could not rule out demolishing the complex if no partner or buyer came forward. "I can't say what the future is going to be," said Mr Burns. The Guild Hall is an iconic building in Preston so there must have been a lot of soul searching before the local council came to this decision. The place was built for the 1972 Preston Guild, but wasn't ready in time, maybe a sign of things to come. The question now is just who will step in to run the place during these difficult economic times. Over in Blackpool, the entertainment company Merlin has taken over the running of the Tower complex from the council with notable success. It remains to be seen if Preston can benefit in a similar way. A future without a Guild Hall would be a bitter blow for the city. "But I am an optimist, there are plenty of professional theatre and organisations who do this sort of work, they know their business well and there will be people out there, I've got a feeling, who will come forward." The Guild Hall opened in 1972 and in the 1970s and 1980s some of the biggest names in rock, including Led Zeppelin, David Bowie and Queen played its Grand Hall, which was also once the regular host of the UK Snooker Championships. But a 2,000 capacity is now considered too small for many major bands and too big for smaller acts. A lot of the retail space in the complex is unoccupied, including the site of a former supermarket. The smaller Charter Theatre seats 800 people and hosts a number of events each year. In December, councillors voted in principle to demolish the bus station, linked to the Guild Hall, and the local authority has applied for immunity from listed building status.